In 1953, Dan Fuller, president of Fuller Fabrics, invited five of the twentieth century’s most distinguished artists—Pablo Picasso, Fernand Léger, Marc Chagall, Joan Miró, and Raoul Dufy—to collaborate on a line of textiles to be called the Modern Master Series. The concept was unique in that the artists were not commissioned to produce original patterns specifically for the textiles. Instead, Fuller worked with each artist to select motifs from their existing body of work, which were then translated by the company’s in house designers into repeating patterns. Fidelity of reproduction was essential, and Fuller’s designers worked diligently to render the motifs accurately for engraving. The patterns were roller printed rather than screen printed, because the fabric was intended to be mass produced and sold at low price points (less than $2 a yard) for use by both garment manufacturers and home sewers. Each artist approved the final patterns derived from his or her work and was involved in the selection of the colors. The collection of sixty designs was much celebrated when it was launched. American Fabrics applauded Fuller for its daring and courage in bridging “the abyss” between fine and applied arts. The museum holds five other fabrics from Fuller’s Modern Master Series in its collection: Birds, and Poisson by Picasso; Vitrail by Léger; Femme Ecoutant by Miró; and Evening Enchantment by Chagall. A McCardell dress in Léger’s Parade Sauvage was acquired in 2013. The dramatic source motifs for this fabric come from Bullfight Scenes, a 1945 lithograph by Picasso. Picasso traveled widely in Spain in the early 1930s. 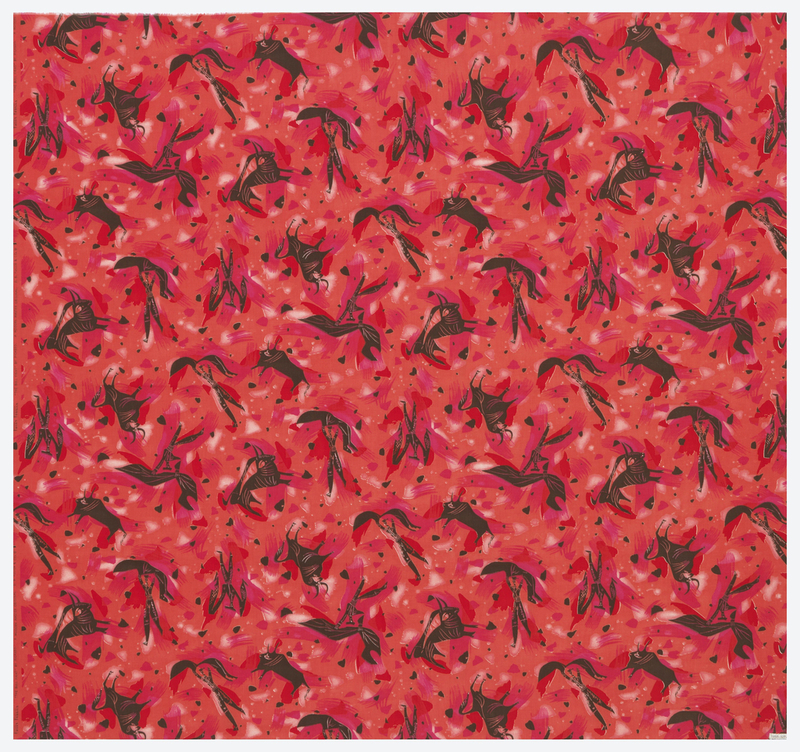 His memories of scenes from Spanish bullfighting rings provided rich sources of imagery for his work, such as the bulls, horses, and matadors featured on this fabric. Picasso also used bulls and Minotaurs as significant symbolic figures in his paintings. The highly stylized animals and bullfighters in this Fuller’s Modern Master’s Series print are set against a vivid background in shades of red, a reminder of bullfighting’s bloody conclusion. After completing the Modern Master project, Picasso collaborated on patterns with other American textile manufacturers and continued to use bullfights as an exciting and exotic source of imagery. A set of bullfight motifs was used in a furnishing fabric entitled Toros y Toreos for Bloomcraft Fabrics’ Picasso Collection in 1963. Picasso later licensed yet another set of bullfight motifs for a PVC-coated fabric for a line of après ski wear manufactured by White Stag. “Trying abstraction on fabrics; adaptations from Picasso, Miro, and Léger.” Artnews 54, (November 1955): 43. Kohle Yohannan and Nancy Nolf, Claire McCardell: Redefining Modernism (New York: Harry N. Abrams, 1998), 126. “Fine arts and textiles come to terms.” American Fabrics no. 35 (January 4, 1955): 49.